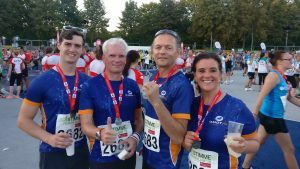 amotIQ automotive Roadrunners attend company run for the 9th time. 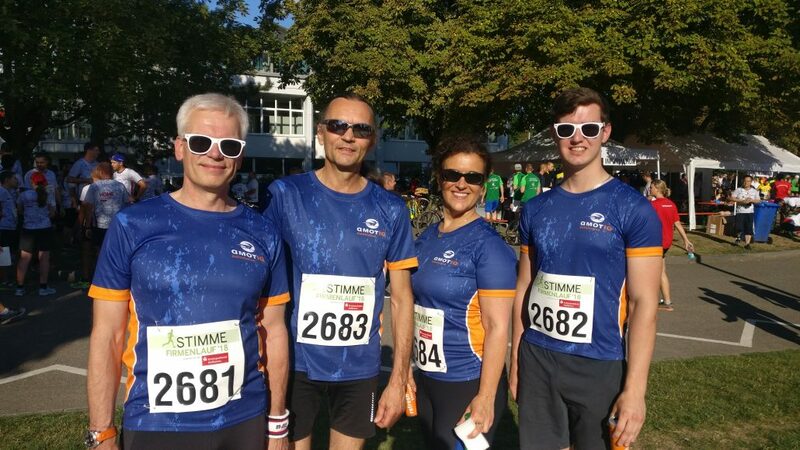 At this year’s Stimme Firmenlauf – 10th Anniversary, our dream team improved from position 558 to position 316 in the mixed teams category. In a tropical heat of over 30 degrees, Peter Heidecke, Jochen Zeising, Albert Renz and Nelly Swiebocki-Kisling arrived to the finish line well – a good reason to be proud! Despite the heat, more than 7,500 runners took part in the run. More than 20,000 people stood along the track and cheered us vigorously. 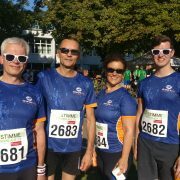 The Stimme Firmenlauf is an annual recurrent team running competition, with four participants running for each team at a time. The distance to be covered in Heilbronn is about 5.75 km and leads through the Wertwiesenpark, along the Neckar and through the city center of Heilbronn. This year amotIQ automotive participated for the 9th time. In 2019 we will celebrate our own 10th anniversary, this time maybe with two running teams? Many thanks to the whole amotIQ automotive Roadrunner Team for participating. That’s what motivated runners look like!